1.) Links: In search engine optimization, a website with many links leading to it from other sites, will receive a big boost to its position on the results page. Search engines give great weight to exterior links that mention search terms when evaluating the relevance of a particular website. Cultivating these links is an effective search engine optimization strategy. 2.) Title and Meta Tags: To really get ahead in the web business game and earn a high ranking for your business, it is imperative that you learn about HTML title and Meta tags. You need to learn how to use them for your own site and also which tags your competitors are using. With a little bit of research, you will quickly learn about how to use quality tags and ultimately earn higher placement. 3.) Research: Treating your SEO efforts like homework is a great way to achieve in the highly competitive field of web business. This means you should be approaching the trafficking of your site like the completion of a term paper. You need to do your research, build a synopsis, bullet the important points, and run down the business checklist to refine the process. 4.) Commenting: Leave comments on other people’s blogs to help the rankings for your website and increase your traffic. This is one way to get backlinks back to your site, but what’s more is that you are interacting with your peers and possible customers by giving your relevant opinion. This makes people interested in you and what else you have to say. Just don’t forget to link back to your own blog or website! 5.) Keyword Optimization: Optimizing your website for search engines will improve the profitability of your affiliate marketing programs. By focusing on certain keywords and tweaking the contents of your web pages, you can significantly improve your website’s ranking on search engine results pages. This will direct more visitors to your site, increasing your own exposure and pulling in more potential customers for your affiliates. 6.) Keyword Weightage: Your homepage carries roughly 50 percent of the weight in searches. Up to 5 percent of your copy and links throughout the site should be weighted with keywords and phrases. This density will give depth to searches and bring your site closer to the top rankings on the major engines. 7.) Images: Include various images on your website so that you can take advantage of the visual searches on the big search engines. Sometimes, it is much better to display, promote or market your product with a picture, rather than explaining what it does with a text description. This will go a long way in improving your visibility as a company. 8.) Sentence and Spellings: Spelling and grammar really do count, especially if your product is information. Have someone proof-read your entire site to avoid embarrassing errors. Not only do mistakes make your work look less professional, but they can result in unintended meanings and confusion over exactly what you are selling and what the terms and guarantees are. 9.) Ranking Monitoring: One of the top tips for search engine optimization is to not forget to stay on top of your ranking within the search engines. By monitoring your progression, you will understand if search engine optimization techniques are producing results or if there is something you need to change. Track your ranking with Alexa or by downloading the Google toolbar. 10.) Title Penalty: When you are creating your title tag, you should always keep it in title case. 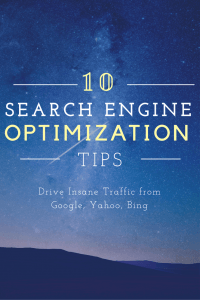 For example ‘Professional Search Engine Optimization Tips.’ Search engines penalize the people who just use strings of keywords and keyword phrases for there title tags and making sure that you title tag is grammatically correct helps avoid this problem.